The PartyLite story began in the early 1900s as a hobby, which grew into a successful business thanks to the entrepreneurial spirit, persistence and hard work of one woman with a love for candles. Today, we are the world’s leading direct seller of candles and top-quality home fragrances and accents. Using over 100 years of experience, we craft the best quality candles, which are available in a variety of forms – each tested for quality, safety and performance. We search the globe for the finest ingredients and work with the top fragrance houses to develop our welcoming scents. PartyLite candles bring warmth, light, beautiful fragrance and style to your home. 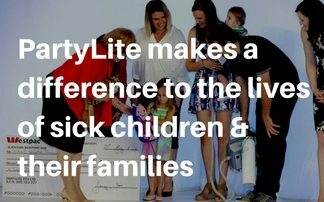 PartyLite Australia have raised money for the Children’s Hospital Foundations Australia.